The accomplishments and progress of the last 12 months, described in this review, represent the commitment and effort of many, many people. Some, such as faculty, staff, students and our clinical preceptors and partners, are very visible. Others, such as philanthropic supporters, community and corporate friends, civic officials and legislators, are less visible but no less a part of the combined effort. 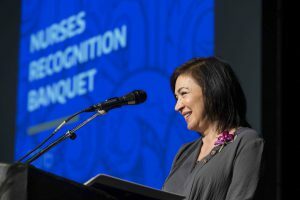 In a larger sense, we are all benefitting from those whose contributions over the last 100 years have built the University of Washington and provided the environment in which the School of Nursing could be founded, thrive, and become a national and global leader. In this, the University’s centennial year, we should all appreciate the honor we have of being part of something remarkable in its scope and achievements. Our focus on the three pillars—population health, healthy aging, and global health—is yielding robust results in terms of research, education, and public service. You will read about many of those results in this report. We have expanded our global vision, raised our national and global visibility, and responded positively to the University’s urging to Be Boundless. Our efforts are contributing, on a daily basis, to better health for local communities, the state, and the world. We have made progress in other ways this year. Our diversity, equity, and inclusion process is progressing from plan to implementation of recommendations. We are well on the way to implementation of our five-year operational roadmap, including its focus on administrative and operational sustainability and efficiency. And our development efforts are providing financial resources that will let us do even more. These infrastructure efforts are vital to our success, and something that benefits from everyone’s input. The School of Nursing is a prime example of the whole being greater than the sum of its parts. I’m grateful for everyone’s efforts, and look forward to another year of success.